Amy Beyer and Caron Mitchell became instant friends when they met less than two years ago. 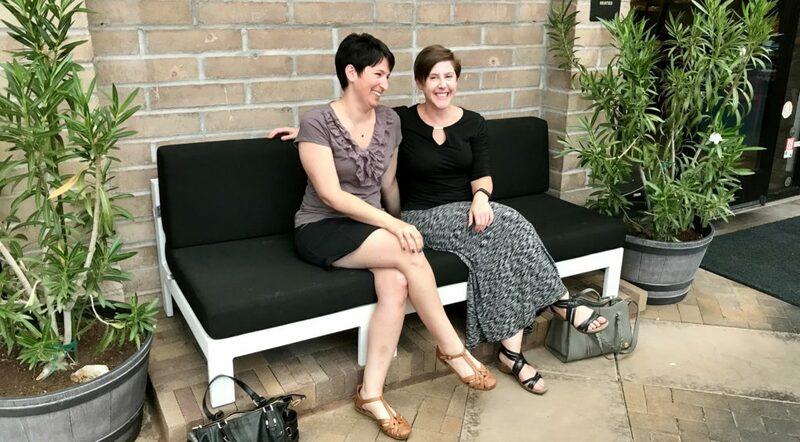 They connected around Zumba, a love for feline pets, and the Tucson Jewish community. Indeed, Caron will be a bridesmaid in Amy’s wedding next year. Just this year, the Jewish Federation of Southern Arizona honored Amy as their 2017 Young Woman of the Year. She currently serves as the Secretary of the University of Arizona Hillel Board of Directors and is active in numerous Federation committees. Amy jokes that the list of Federation activities in which she has not participated over the years is very short. “I feel very passionate about my Judaism,” says Amy, whose parents Bruce and Donna Beyer also are very active in Tucson’s Jewish community. Caron is beginning her second year on the Board of the Jewish Community Foundation and particularly enjoys her participation on Foundation’s Professional Advisors Group. She also is the Treasurer of the Jewish Community Center Board of Directors where she has been involved for the past several years. Caron says that the JCC was her “gateway drug” to a more active Jewish life. Her mother and father live locally; mom is Jewish, dad is not. Both young women signed the Endowment Book of Life several years ago and both established Donor Advised Funds at the Foundation last year, taking advantage of a donor-funded program that provides $1,000 each to help new donors who contribute $4,000 to open DAFs with a $5,000 minimum. Both are very involved in local Jewish organizations. “We are thrilled to have Amy and Caron as part of our donor family,” says Foundation Director of Legacy Giving Brenda Landau. Caron is a Certified Public Accountant with her own business who says that even if she won the lottery, she would work because she loves helping people navigate change in their work and personal lives, which are often intertwined. She says she’d also spend more time designing costumes, which she loves to do in her free time, particularly for the annual Arizona Renaissance Festival. Amy has a master’s degree in elementary education but gave up teaching for more lucrative pursuits about seven years ago. She works for Conduent, which split off from Xerox six months ago. She is a Business Analyst, currently serving as a liaison and interpreter of sorts, helping to bridge the gap between Conduent software developers and the company’s product managers. Caron thinks Amy is so good at what she does because “she has patience and can turn big concepts into a series of small steps, and keep a lot of people with a lot of opinions on track.” Oh, and if Amy won the lottery, she’d be giving her time to a wildlife rehabilitation organization. Both have given a lot of thought to interfaith marriage. Amy’s fiancé Tom is not Jewish and neither is Caron’s boyfriend. “It is so important to accept and welcome partners and family who are not Jewish into the Jewish fold because that helps keep their Jewish partners connected to the community. When non-Jewish partners are not accepted, it’s easier to drift away from Jewish involvement,” says Caron.